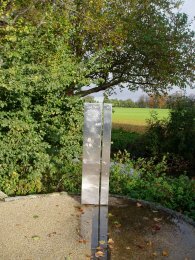 I walked this, the seventh stage of the Capital Ring from Richmond to Osterley Lock on the 11th November 2006. It was another very short stage and I also went on to walk the next two stages as well. It had been early April since I had last been at Richmond on the Capital Ring however with the days drawing in it was ideal for a walk nearer to home. It was also the first day since last winter that I needed to keep my fleece on the whole time I was out. The walk down to the Thames from Richmond Station to rejoin the route seemed considerably shorter than when I had walked the other way in last April and in no time at all I had crossed Richmond Green, photo 1, headed down Friars Lane and reached the path besides the river. Heading downstream the path passes under Richmond Bridge, the ironwork stating it was "Made & erected by the Horseley co ld, London & Tipton - 1908", photo 2. The path continues for a short distance besides the River Thames with the Old Deer Park on the right until Richmond Lock and Weir is reached. 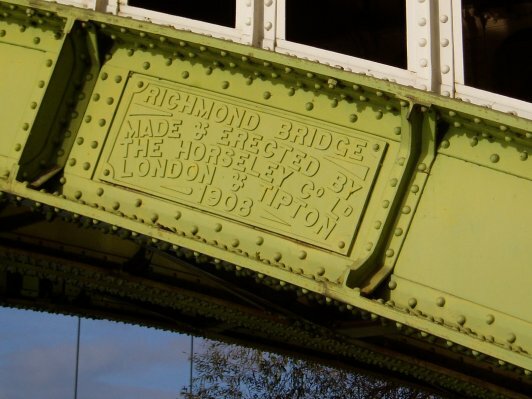 Richmond Lock is a half-tide lock and barrage, which also incorporates a public footbridge which the route of the Capital Ring uses to cross over to the North bank of the river. Once over the River the path continues on its way downstream towards Isleworth. Just before Isleworth Ait is reached, photo 3, the path is forced to leave the river bank and heads along the A3004 for a short distance before turning down Lion Wharf to rejoin the Thames. As I was walking along the main road a van drove through a puddle at the roadside that showered my legs in water, fortunately as I had my Rohan walking trousers on they did not get too wet and dried of relatively quickly. The path passes between the tables and chairs laid out in front of the Town Wharf pub and heads on to a small wooden bridge over the Dukes River. Photo 4 was taken looking downstream over the mouth of the river. Unfortunately as the sign in photo 5 shows the wooden bridge is currently closed with boards nailed across either end. While not recommended I decided to continue over the bridge anyway. Climbing over the other side the path continues for a few yards up the side of the Dukes River before taking a passageway under some flats and through a iron gate to join Church Street. I'll repeat that this is not recommended and you should retrace your steps past the pub and head up Swan Street to join the road a bit further up Church Street. 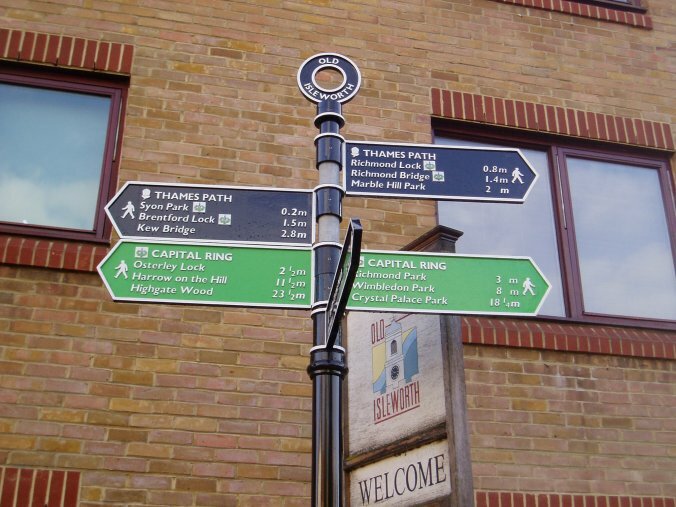 When I reached Church Street as well as the Capital Ring finger post in photo 6 there was also a much smaller sign saying "Thames Path temporary route from Dec 04". Well that is almost two years ago, not very temporary. How hard is it to fix a small wooden bridge? Apart from damage to a couple of slats at the start of the bridge the whole structure seemed relatively new and quite sound. I have been over far worse when out walking without a second thought, (you still shouldn't do what I did though). My guess is that the real reason the bridge is shut is that the property owners besides the river do not want lots of walkers passing by their front windows. Dec 11 - Since I walked this stretch of path the buildings just before Dukes River is reached have been demolished and replaced by housing along with a path running up the side of the river to Church Road, removing the need to either cross over the bridge, which is still boarded up as it was 5 years earlier, or head back along the path to Swan Street. Anyway, the path continues along Church Street briefly rejoining the Thames before following the road round to the left and entering the grounds of Syon Park. The path heads up the driveway, photo 7, and past Syon House, photo 8. Overhead there was a constant stream of aeroplanes passing overhead, getting ready for the final ascent to Heathrow airport. Leaving Syon Park the Capital Ring takes a footpath that leads to the A315 London Road which is followed for a short distance to reach the Brentford Arm of the Grand Union Canal by the Brentford Gauging Lock, photo 9. For the rest of this stage of the walk the route follows the canal. Heading up the canal the path passes through an area where there have been a large number of canal side flats built as well as large shiny modern office blocks, photo 10. There does however remain one stretch, as yet undeveloped where the canal towpath and Capital Ring path with it, pass under an area of old covered Wharf, photo 11, in sharp contrast to all the other buildings around. The canal passes under the A4 and further on, having past Clitherow Lock, photo 12, goes under the Piccadilly Line and the M4 motorway. A little further on the path takes the Gallows Bridge across to the other bank of the canal, photo 13, before heading up a short distance further to reach Osterley Lock, photo 14, and the end of this stage of the Capital Ring. The GPS made the length of this stage, including the walk from Richmond Station, 4.2 miles long. It was another pleasant walk in two distinct parts, firstly alongside the River Thames and then up the Grand Union Canal. Early on in the walk the Capital Ring crosses the site of the old original line that used to run through the Kew Observatory and besides the Thames path a metal sight line has been erected looking towards the observatory, photo 15. From Osterley Lock I continued straight on to stage 8 of the Capital Ring.